My father was a builder. In the 1930s, when he was a boy, he built a boat with his father. In the ’60s, he built a boat with his son, our brother—a project that occupied half of the garage at the President’s Home for more than two years. In the 1980s, when he was in his sixties, he ordered several tons of stones and built a dry-stone retaining wall—twice. He wasn’t pleased with the first version, so he took that apart, stone by stone, and rebuilt it. If you walk north on Grand Avenue to Richards Street, you can see it, in front of the Moseley House, now the Chaplain’s home, where John Williams and his family live. 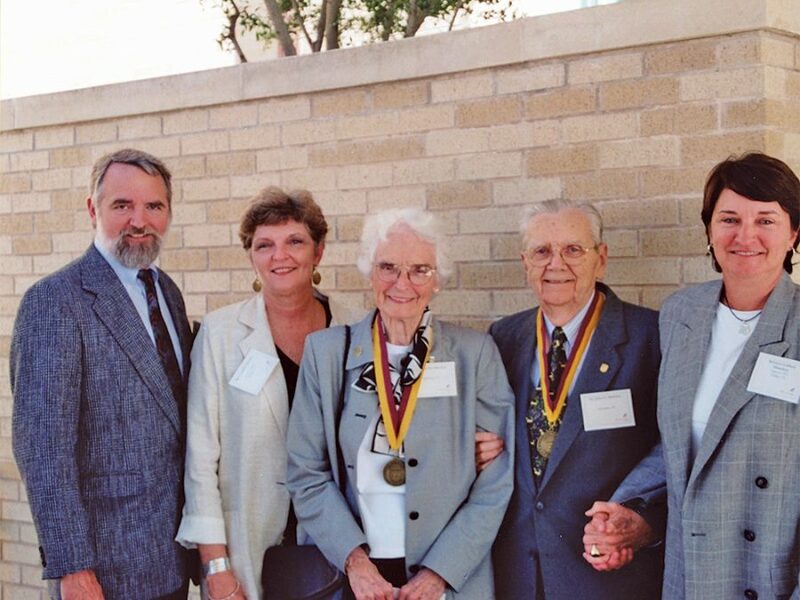 Sixty-four years ago, our family moved from Austin, Texas, where Daddy was the founder and executive director of the Texas Legislative Council, to Sherman, when he became the 12th president of Austin College. 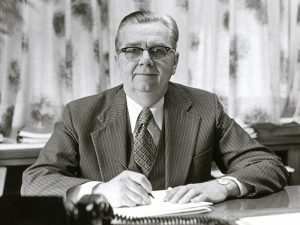 Unlike his predecessors, he was not a minister, nor did he have a Ph.D.—he was a lawyer, like Steven O’Day, 16th president. Daddy came to the College with a mandate from the Board: fix it or shut it down. There was a lot to fix: at the time, enrollment totaled approximately 350—in fact, when Daddy first addressed the students, he thought he was speaking to the senior class, not the entire student body. The campus was small and unimposing—only 10 buildings on a tract of land much less extensive than it is today. Several city streets cut through the campus. The curriculum was a hold-over from the post-war years; the faculty numbered fewer than thirty; and the financial picture was beyond bleak. Confronted with significant challenges on virtually every side, Daddy immediately set to work. In his 28-year tenure, he laid the foundation of the Austin College of today. Many say that he was the defining president of the College. He built 19 buildings and facilities; he built the faculty in size and quality; he fashioned a new governance system and an innovative new approach to curriculum. Finances improved; the endowment increased; and the student body grew to more than 1,200. Driving all this building was Daddy’s laser-like focus on the future—anticipating and preparing for it. He firmly believed—and bet the College on it—that a future-leaning liberal arts education was the door to a meaningful and productive life. His mantra was a series of questions: what does the student need to know to live successfully in that future? What does he or she need to be able to do? And what kind of person does that individual need to be? It was all about the student—about you. And it still is—your knowledge, your skills, your character. The Career-Readiness Check that is being highlighted this weekend responds to those questions and is exactly the sort of program that Daddy would have embraced wholeheartedly. It is innovative; it is directly applicable to your future; and it brings generations of students together to share their questions, experience, and knowledge. He would be proud! When you need to get out of the library or residence hall or you’re just tired of staring at your computer screen, take a walk up Grand Avenue and have a look at Daddy’s retaining wall. Like Austin College herself, it will be there for a long time.